Well . . . without much hype and missing many training updates, the Gopher to Badger Half Marathon was this past weekend on Saturday. I shot a beautiful wedding with Jen and Andrew, up at The Refuge in Oak Grove on Friday. After being on my feet all day, I got home at 10:15ish and hit the hay, immediately, if not sooner. My morning alarm was brutal, but I got out of bed at 6:15am to make some coffee and fix myself a piece of peanut butter toast. I hadn't picked up my race packet prior to the race, so I had to hustle to get to Hudson by 7:15, but I just got in under the wire and loaded up in one of the last shuttle buses. As we made our way to the start in Stillwater, I sat next to a crazy Irishman who told me all about his past as a professional lightweight fighter, his marathon and ultra-marathon history and how his goal was 1:34 for the day, since it was a training run for the upcoming Twin Cities. I told him my goal was to beat 3 hours [or before they closed the course on me]! I've never done a race completely by myself. I didn't know a single person. And at my urging Tony kept his plans and stayed home with the boys, instead of lugging them everywhere to cheer for me. It was very odd. I didn't bring my phone or any music with, but thankfully it was only a short time before we were running. I knew I didn't have a chance in heck to come close to my previous times, so I wasn't too nervous. There was just a short burst while we sang the National Anthem, but it quickly left as I started chatting with the 2:15 pacer from Minnesota Pacers [they are amazing by the way]. Unfortunately the course was quite hilly, which I wasn't prepared for, but had been forewarned about. Who am I kidding? I wasn't prepared for anything! 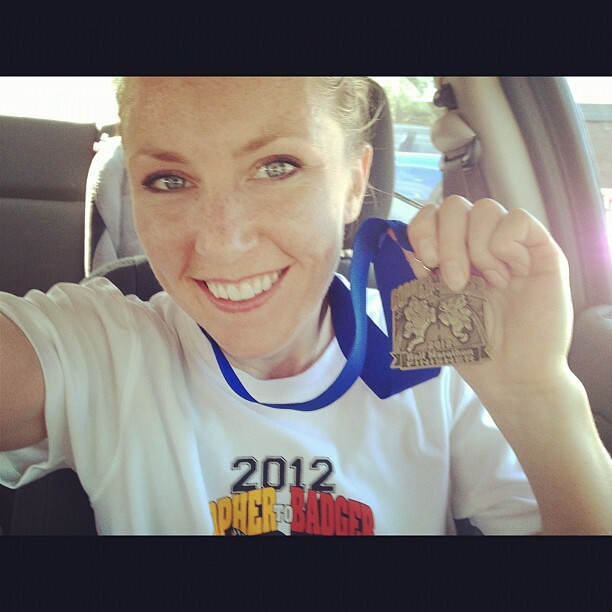 The last time I ran was the week of July 25th, when I wrote this post. My longest training run for this half marathon was 5 miles and I didn't run a step in the month of August. No exaggeration. I couldn't have run more than 20 miles in training for this over the course of 3 months. I had a few friends suggest faking an illness or an injury, but it didn't even cross my mind. See, this run was suggested as a part of my Career Development Plan at work, as the discipline required to train for a half marathon translates so well to all facets of life . . . when you are actually able to be disciplined and train! Unfortunately that part didn't happen, but I knew that my like minded competitive and athletic boss would never let me live it down if I didn't finish it. Just like I wouldn't let it go either. So I ran. And at 3 1/2 miles in a hill killed me. So I walked. And I lost my 2:15 pacer group. For quite some time I was in no man's land between pacers, before the 2:20 pacer finally caught up with me. I alternated walking and running and running and walking. I drank water and gatorade at every aid stop, which I never do. I ran and I walked and I set arbitrary goals like running until a sign, or walking until a driveway. I counted seconds and then minutes and tried to do consistent intervals. I tried to encourage as many as I could along the way. I blocked out miles 5-10. But suddenly, it was mile 10 and I knew I would finish. The 2:30 pacer passed me at 10 1/2 miles, but I kept my sight on her and tried to gauge our distance. I ran almost all of mile 11 and then told myself I didn't care if I walked the whole rest of the way in . . . but then a girl who started with me at 2:15 called out to me as she started to run it in and I couldn't push aside my competitive drive. So I ran. And I kept running. And I finished a wholly untrained for half marathon with hills in 2:35:22. That's quite an accomplishment! Congrats lady! You are my hero... one day I will be like you... that's all I can say..
Add this to another reason you're my hero. :) Seriously amazing! Nice work...and btw, you look way too good for having just finished 2+ hours of running! That is AWESOME! What an accomplishment!